We take pride in our sensitivity to your individual needs and our ability to provide numerous services that contribute to optimal dental health. We use the most advanced technology, materials, and techniques available for your specific preventive, restorative, and cosmetic needs. 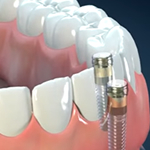 A dental implant is a great alternative to replace missing teeth .A implant is small titanium base cylinder that is surgically placed in the jawbone. 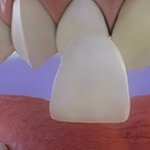 Implants can support single crown, long span bridges or support a full or partial dentures. 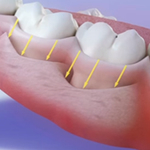 They are considered a long term restoration and provide great aesthetic results. The Gum disease is an inflammatory disease, it cause irritation to the gum, bone and supporting structures around the teeth. How we determined if we have a gum disease problem? The signs and symptoms are: red, swollen tender gums, these conditions cause bleeding when you brush, chronic bad breath, chronic bad taste in the mouth and sometimes loose teeth. Most people experience different level of anxiety at the thought of visiting a dentist reason why the sedation dentistry has been implemented to many practices. 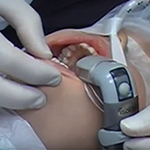 Sedation allows the patient to feel completely at ease during the dental treatment. Who is a candidate for oral sedation? Patient with fear of needle or other dental treatment or require complex treatment. A Crown is a protective covering that is cemented onto your tooth. 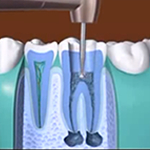 A crown may be recommended for a tooth has a large filling a root canal or a fracture. A bridge is simple 3 or more crowns linked. 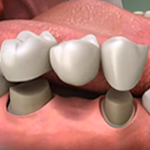 Bridges helps to replace missing teeth, keeps teeth from drifting out of position and improves aesthetics. Root canal treatment treats disorders of the nerve of the tooth .The most common factors contributing to a need of a root canal treatment are: Physical trauma to the tooth. Physical irritation cause by a deep decay or a large filling. We utilize state-of-the-art digital technology which allows for better, faster results. Payment plans can make affording the dental treatment you need easier when you’re uninsured or underinsured. At Gallardo Dental, we’re happy to split up your out-of-pocket payments into monthly payments to help ease any financial burden.